When I was barely 25 years old, on Australia Day 1970, with the aid of Alcoholic’s Anonymous, I managed to stop drinking alcohol and using other drugs, and have stayed that way. In those days, a number of long-time members of AA in New South Wales, including stalwarts like the misnamed “Happy Frank” and the flamboyant “Ukulele Jimmy”, would share at meetings how they only got sober and free of other drugs after being compulsorily medically incarcerated and treated for their alcoholism and addiction – under what was known as the “Inebriates Act”.They said that long-term compulsory incarceration almost certainly saved them from suffering irreparable brain damage. The rationale for the Inebriates Act of 1912 in NSW was to protect alcoholics from seriously harming themselves (and also their families), by denying them any access to alcohol and other drugs for a substantial period of time and providing them with a treatment regime that, from the late 1940s, often involved exposing them to the 12 Step program of Alcoholics Anonymous. At the very least, incarcerating people under the Inebriates Act provided some security and protection for alcoholics and their families, plus some chance of improvement in their health. A few years ago I gave a Speech Night address at a leading private school, at which I also presented the final year school prizes. In my speech, after I told a little about my own descent into alcoholism and other addictions, and my subsequent recovery, I pointed out that about 8% of all present that night , pupils, parents, teachers , either were, or could become, addicted to alcohol and other drugs. After my address a lad who had won three prizes asked to talk with me privately. “My mum’s an alcoholic, he said, “and for the last two years IÃ¢â‚¬â„¢ve been too embarrassed by her behaviour to invite anyone home. “How is she? I asked. He replied : “She’s now got Korsakoff’s syndrome (commonly known as a “wet brain) and sheÃ¢â‚¬â„¢ll never come home again. As it turns out, his mother had just turned 40! If only, I thought, that woman could have been compulsorily admitted for medical treatment before she reached the irretrievable stage in which she now finds herself. Or even if she had been sent to gaol where there is at least some chance that, like a number of inmates throughout Australia who are imprisoned because or as a result of their addictions, she could have been “dried out” and subjected to some type of effective treatment. A recent edition of ‘The Medical Journal of Australia’ features an important article entitled “Involuntary treatment of drug and alcohol dependence in New South Wales: an old Act and a new direction.” A key question posed by this article, dated 17 June 2013, is will new legislation address the dilemmas raised by a century-old Act for involuntary treatment of addiction? As a member of the NSW government’s Expert Advisory Group on Alcohol and Other Drugs, chaired by Professor Ian Webster, some of us pushed strongly for a revamped version of the New South Wales Inebriates Act of 1912 – which, although little used, was still on the statute books. As a response to detailed submissions, led by Professor Webster, to the Standing Committee on Social Issues Inquiry Into the Inebriates Act, 1912, the NSW Government has funded two centres for the involuntary treatment of severely addicted persons whose survival is threatened by their addiction. One centre is at the Royal North Shore Hospital, the other is in Orange. As Professor Webster points out, the treatment goals are the health and safety of the addicted person, their need for medical treatment and stabilization and the restoration of their capacity to decide for themselves whether or not they will participate in further support and treatment. Admission must be authorized by an accredited medical practitioner, be limited to 28 days (with options to review) and be overseen by the courts. At the NSW Alcohol Summit in 2003, at which I was a keynote speaker, spouses and parents harrowingly described a number of suicides – as they had helplessly watched the self-destructive acts of an addicted family member. Their pleas and searches for help had gone unanswered. Intervening when a person with a severe addiction is unable to give consent raises difficult ethical questions. It is a decision that many in our community oppose , especially civil libertarians. But when medical intervention aims to ensure survival or to resuscitate a person to a point where they can decide for themselves, such actions can surely be seen to be in a person’s welfare, especially if it is time-limited, and subject to legislated safeguards and judicial oversight. From my perspective, it is hard to disagree with Professor Webster’s conclusion that, despite difficulties in implementation and opposition in some quarters, there is a clear “imperative for the state to develop ways in which it can intervene in those persons whose state of Ã¢â‚¬Ëœchronic inebriationÃ¢â‚¬â„¢ leads them to be at risk to themselves and to others”. 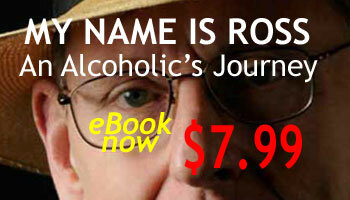 Ross Fitzgerald’s memoir ‘My Name is Ross : An Alcoholic’s Journey’ is now available as an e-book. The Telegraph (Sydney), Saturday July 13, 2013, p 41.